5/10/2017Share this story on Facebook! Celisa Calacal '18. Photo submitted. However, the article’s author, Texas A&M student Susannah B. Hutcheson, said that Calacal’s non-celebrity status was a huge part of why she was highlighted in the star-studded article. 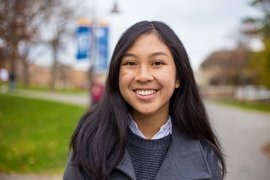 “I loved how Celisa is a young, vibrant college student with a solid opinion,” she said.